Just to let any listeners know…. The podcast host that I use, (garageband/Gcast), is no longer accepting uploads and will close in august, I believe. I have yet to decide if I’ll continue producing the podcasts with another host. I’ll need to find a reliable and free one. Gcast were a great host, very simple to use and cost effective. My thanks to them for the ride, so far. GarageBand had an option to transfer files across to ilike which is linked to facebook somehow, (you’ll remember I’m no tech wiz here). I’ve taken this option but so far I haven’t been able to find my own files. I still have copies of the old shows, so if I do find another host I’ll probably put them up there too. Download the episode from Gcast here. This week I had fun with a Romper Room magic mirror and tried to thank all those who have left a comment recently. I really appreciate it and it really does keep the podcast going. I also enjoyed putting the cluster map on the site and seeing where people are visiting form. I love having one listener in Trinidad, for example. This episode I talk about my trip to the dentist where I got a healthy dose of knitting conversation along with my check up. Some mentions on Ravellry and Alan Dart. I’ve done some reasonably successful Jelly Crystal dyeing but wanted to experiment with the Rhonda Trounce Dyes that my Mum passed on to me. Whilst waiting for the yarn to simmer and absorb the dye I decided to learn Tatting. Totusmel has some cool instructables and a utube video for tatting. and this more bizzare and less successful botantical specimen. 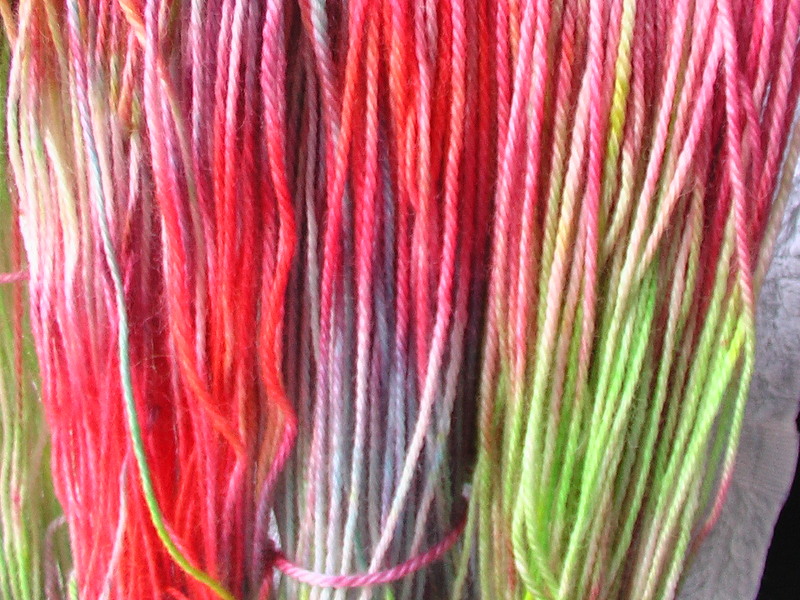 Here is the fibre in the pot – I’m reasonably happy with the colours. What pattern shall I knit with it? I have about 15o metres of sportweight yarn. I found “The Yarn Collective” – an outlet for indie dyers and sellers in australia. What happens when the cafe` you chose to knit or stitch in is actually a wine bar? In this episode you will meet lorraine – who seems to have some interesting theories on Yarn – the product and/or Yarn – the magazine. In this episode we have a look at juxtaposition as inspiration – prompted my my vision of a sheep running down a city street just near Glebe. Does anyone know what happened to the sheep? I visited the NSW Art Gallery – they had a cool multi media exhibition on. Thanks to everyone who has emailed or commented or pm’d me on Ravellry. I think I’ve got back to you all but if not…give me a shove and I will because I appreciate all your good wishes and prods to get back to podcasting. Thanks to Gigi and Jasmine from The Knitmore Girls for playing my promo. See Ecoyarns to contribute to a collection of craft items or coles vouchers for those affected by the fire. The following podcasts are returning (Yay!) Christa Knits, Stitch Stud and his Bride, SSK. Also Maria Theresa from Knitting time together is planning to return so keep your eye out. Check out the new Australian podcast Craft Cartel which comes up on my itunes as Radical Cross Stitch. It’s great, mate. Wendy has been organising KAL’s. She’s just taken down the page for them though but you can find them here. I’m linking to her handdyed fibre and yarn page where you can purchase some lovely yarn if it takes your fancy. I really like that kettle dyed mauvey colour. She also sells patterns here. Another installment in the make of the Threepenny Pullover by Veronik Avery. I’ve decided to forgo the edging on the cuffs – being as the arms are long enough already. I have a spinning wheel – an Ashf0rd Traditonal lent to me by my SIL – I love it. The halfway decent yarn I have produced. I recently found some lovely yarns at Ecoyarns…I had some Christmas money to spend…yay for Christmas money. I’ve enjoyed teasing my husband with pictures of Art yarn from Intertwined by pluckyduck. He doesn’t particulalry like the slubbyness…but he’s ok with the colours so I can experiment with a yarn for him – of course I can always experiment with a yarn for me too. And I will! I’ve found the $10 swap group in Ravellry! I am still trying to find a starbuckles replacement – why is it that everyone thinks I’m a complementary childcare worker whenever I pull out my knitting or stitching? I’ve found save the words.org which has a wallpaper of endangered words. Today’s word lost in the woods is “secability”. Can you supply and sentances for lost words? Today we have a listen to Katie’s visit to the yarn store. Ever had one of those days where you walk into everything? Or is that just me? Many of you asked how I went in the writing course. It was a fabulous course and I enjoyed it very much. I did pretty well marks – wise to0, so I was happy. BUT – I find writing quite hard…so I was incredibly excited and relieved to find this talk by Elizabeth Glibert. Download this episode from the G-Cast site. I just wanted to say a big thank you to all who have emailed or contacted me through Ravellry to say “Hi” or let me know that you are patiently waiting until things get better and I can put out another podcast. I really appreciate your support. This isn’t in the show because I didn’t realise it was still going, but Manda from Knitting Psychos is doing a walk for Breast Cancer. She needs donations and has a contest going for those who donate. Visit this post to find out more. In my primary school days I was most taken with a Bargelllo project in shades of purple; a green macrame owl and acryllic wool God’s eyes. The main annecdote in this episode is written by Jessica from Folk and Fairy. You can read it and view the beautiful accompanying photograph here. It was time to buy my Mum a gift again. I bought her some handmade earings made of china from the broken vases that families smashed under the Communist regime in China. In my travels to find Mum a gift I discovered some handmade felt scarves and embelished teatowels. I didn’t have the time to make her a gift, but wish I had. I wish I had the time to start a new craft, and ever hopeful, I’ve jsut bought a tatting shuttle…does anyone know how to do this? I’ve seen a video on u-tube. I’d love something like the wooden shuttle she’s using – I’ve only ever seen a red plastic one here – which is the one I bought. Wouldn’t you know it! Just as I started this new section, the Starbucks corporation has decided to pull out stores in Australia and NZ. Don’t they know I have a podcast here?! So, I’m on cafe` crawl to find a new stitch spot. Today I explore one destination by the sea, but the search continues. Today we have Melissa’s visit. She laments the demise of another local yarn store. But she also delights in the closing down sale. Speaking of LYS’s – I’ve heard on Ravellry that Rubi and Lana’s at Gordon, Sydney, is closing down. This is one of the most pretty and cosy yarn shops in Sydney. It’s such a shame. Believe it not, Ripley, I was inspired by Sport! Specifically by Sally McLennan’s approach to her “finals”. This song was from the Podsafe Music Network. Hello my lovely listeners, I’ve noticed that there are spikes in people checking this site so I’m assuming some people have set times in which they check to see if a new episode is up. I know it’s been a long time, way too long, since I’ve got an episode up so I just thought I’d let you know that one is on it’s way. Personal illness – But not to worry, I’m on the mend. My Father having been diagnosed with cancer. But not to worry, it’s a slow progressing kind and after a nasty operation he should be fine. Our big computer crashed. But not to worry, we got a ltitle computer and now are transferring files on to the small one and setting up sound recording etc. This is taking me some time as I’m not very techy! I’ve started a new writing course. Hopefully, even though this means less time for me, it will mean better writing for you! There’s always hope! Anyway, I just wanted to let you good people know why it’s been so long between episodes, not that I’m famous for my consistency anyway, but I didn’t want you all to go away or to think that I had gone away! I enjoy podcasting and hope to be back very, very soon! Many thanks to Wendy from Wendy’s Modest Dress for sending me my first podcaster pressie, which I am obviously very chuffed about. I received four gorgeous skeins of hand dyed yarn in the colourway “Antony and Cleopatra” – beautiful purples and aqua’s. 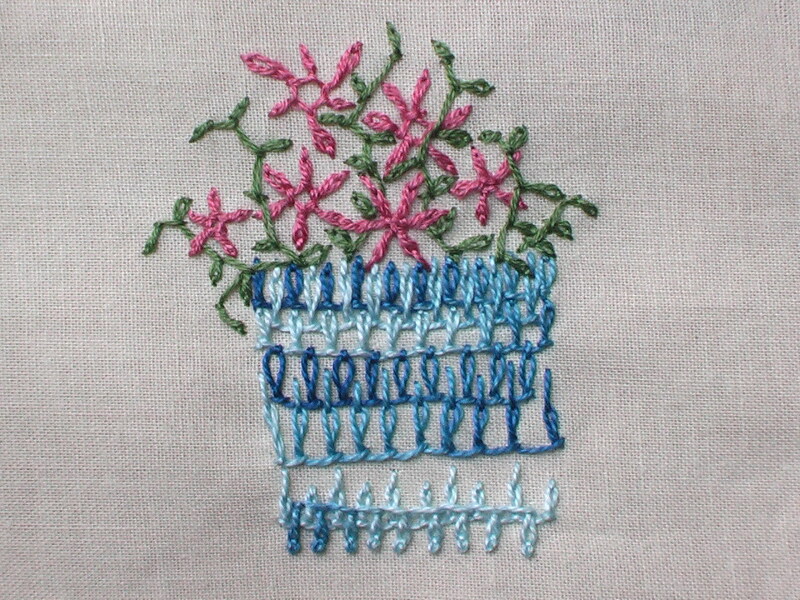 Wendy sells custom handmade sock bags as well as fibre…check it out here. Thanks to Yan Tan Tethera from Ravelry for sharing her instructions for the boarder of her pinwheeel baby blanket. A long overdue thank you to those of you who have left reviews on itunes – it’s very much appreciated. Thanks to those who have left comments on the site or contacted me through Ravelry to let me know you enjoy the show or make friends. It’s great fun to see where you are all from, and really helps encourage me to keep going with this. There are two new podcasts… Miss Flipp Knits and Pomcow. I am still working on the TAST Challenge, whilst others are working on the TIF challenge. I finally did some Jelly Crystal yarn dyeing. I used the instructions in Yarn Magazine – issue one. Ever had a bad day at work and retreated to the yarn store to ground yourself? You might like Selina’s story…. This weeks inspiration is a movie review by an anonymous mother. It is for the movie Smart People. Scroll down to the bottom of the “what you say” collumn to take a look. and “Flutterby Butterfly” by Josh Woodward. Thanks to all those listeners who have still kept on subscribing to the podcast. I really aprreciate it. Thanks also to those who have got in touch to leave comments either at this site or on Ravellry. I really enjoy hearing from you. The number of knitting podcasts continues to grow – Here are three new ones to try. My stash of yarn is pretty small but my stash of love overflows – this is a tale of how Valentine’s day was celebrated at my place. At the moment my favourite stash yarn is Madil Kid seta in a beautiful cornflower blue. Also…I though I’d just mention The Wool Inn at Penrith, NSW. It has a pay as you knit system going where they hold yarn for 2 months so you can buy it a bit a t a time – good for all us thrifty knitters…not that I live close enough to make use of it – what a shame. THE PAY IT FORWARD SWAP – I have joined this swap but no-one has joined me. If you think you might be interested check out my personal blog for the guidelines. Yay! It’s a new Segment! I hope you enjoy it. I hang out at Starbucks a fair bit because they leave me alone while I’m knitting or embroidering. I’m going to collect some stories as I sit there…and bring them to you. In this episode you’ll hear the first installment about my encounter with a very young and novice stitcher…and her Mum. This is an entirely fictional account. I couldn’t go past Kevin Rudd’s apology speech to the indigenous people of Australia in the inspiration stakes. Here’s a link to some information about it. I also mentioned that Autumn has come to Australia, NSW. It’s good and inspiring knitting weather. Hello to everyone and happy 2008! Thanks to those people who have dropped me a line on Ravellry or via email or added me to their friends list. It is much appreciated. Also check out Knitterati – a cool videocast. And if you’re in Orange, NSW – you could pop by a shop called Caboodle, on Ansen St. In this podcast I tell a story about my ineffectual knitted Christams gift – that I will have fond memories of even though the recipient may never remember it and the gift may already be sitting in a bin somewhere. In this episode I mention a phenonomen that I’ve noticed since I’ve begun to tell people about my crafty ways – people will give you supplies. I call it “scouting”, as in, others will scout out things for you…anyone know of a cheap spinning wheel????? An in my own “scouting” I have found that Eco Yarns are having a sale on soysilk and bamboo fibre – it’s discounted by %75 and there’s only a small amount left – good luck. This weeks character was inspired by my own visit to Dubbo in NSW, over the Christmas period. I have visited the country before, of course, but this time I’d primed my husband to stop at any open and interesting yarn stores…problem was… I couldn’t find any??????? Inspiration is such a personal thing and yet I try to define it once again. Thanks to those listeners who have joined the $1 challenge over the last month or so and left comments on the site to share their treasure. Thanks also to those who have dropped by and said “Hi” on Ravellry. Unsuprisingly I am listed as “changeling” with the same image as for the show. There are two new podcasts to announce – The Crochet Side – hosted by Brianna and Knit Sibs – hosted by sisters Valerie, Gloria and Julianne. In this podcast I regale you with a knitting travel story – brought to you by State Rail. My current knitting project, now accidentally sprayed with Coke (-a cola), is the Notre Dame de Grace jumper by Veronik Avery. Through looking through a number of webrings I recently found a free pattern for “The Changeling Shawl” by Linda S Davis from The Tail Spinner. I wondered what other free fairy patterns I might find. I consulted Aimee from Fairie Knits podcast and she suggested the Candle Flame Shawl from KnitPicks. In this episode we met the character of Simone. Simone has bought some roving, or maybe a Spindle. A former student of mine produces a ZINE called Branches with Leaves wich features her phototgraphy. The fact that other people are motivated enough to produce their own creative work for it’s own sake is very inspiring to me. All music from today’s podcast came from The Podsafe Music Network. Thank you to everyone who has come back to listen to the podcast – I know I’ve only been getting one out every month or so. My hat goes off to all those other podcasters who manage to write an essay a week! I can’t seem to do it. But I do thank everyone who’s stuck it out with me. In this episode we explore buying a gift for my mother’s birthday. Will it be a store bought or handmade gift? Will a case of shopping centre weirdness interfere? After some positve experiences in a variety of thrift stores I’m putting out a $1 challenge – just for fun, ’cause I’m not really that competitive. What have you found for $1? Leave the results of your challenge in the comments section! Today we listen to the results of Poppy’s visit to the yarn store. Have you ever tried to indoctrinate someone into the ways of yarn…or were you the indoctrinated party? I think there’s been a little bit of Poppy in me at times. OK…I may be yearning for better days but today I found a protest to be most inspiring. People care. It’s good to know this, whether or not we all share the same views. The APEC conference is here and there are protests organised for Friday, which has been declared a public holiday for those working in the city…the question remains…once a public holiday has been introduced , can it be withdrawn the following year. Will the Australian public stand for this? There are lots of links for the Apec Protests – try this one or this one or this one. There are lots more as well as links to other protests all over the world. I’m hopeful that these will be peaceful protests.